Ryan and Shayna were such an amazing couple to work with. We were so honored to be their wedding photographers. They were so laid back and such nice people. They wanted their wedding photos done at Niagara Falls State Park. We pretty much all grew up going to the Falls, so we knew some great places to take photos. 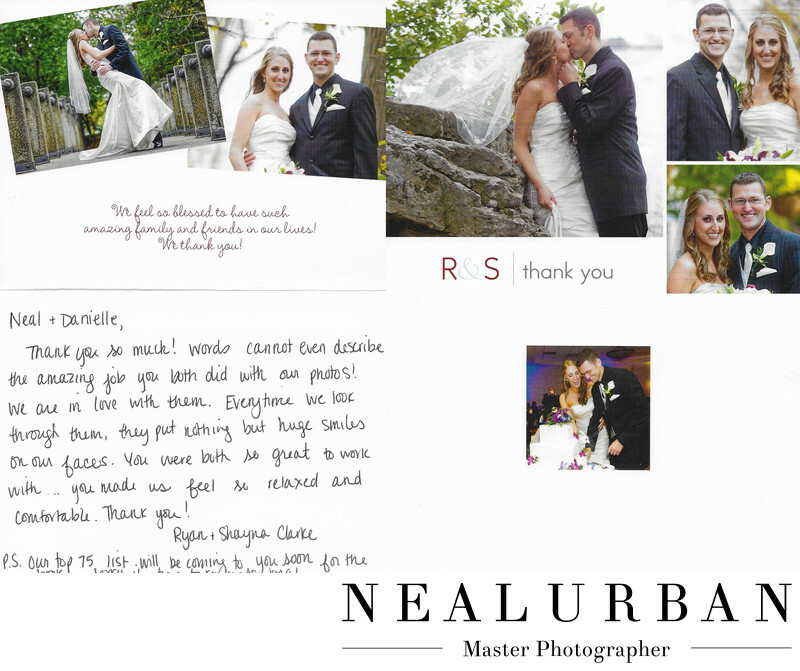 We loved how the bride and groom picked so many images for their thank you card. We got some really great photos! They mentioned they had a really hard time deciding on which to include. They did a great job! Most of them were from Three Sisters Island. That is one area of the park that has some bridges and giant rocks. They look great in photos. It was also not as busy here. Niagara Falls is a wonder of the world. People come from all over the world to visit the park. There are so many times where tourists end up in the photos. There may be no way around that either. We always tell our couples this could happen going to this location. The reception was at the Sheridan in Niagara Falls, so very close! We loved how they selected one of the cake cutting images for the thank you! They put it in the back. It was a great way to end the flow of the card! The bride and groom had such nice things to say to us. We love receiving thank you cards from our clients, especially when they use the photos we have taken! Location: Niagara Falls State Park 332 Prospect St, Niagara Falls, NY 14303.